had the pleasure of attending the 2013 Abrams Family Foundation History Seminar on Friday and Saturday at the State Archives of Michigan located in the Michigan Library and Historical Center in Lansing (http://seekingmichigan.org/events/2013-abrams-genealogy-seminar). This was my second year attending this event, and I was not disappointed. Although there were many excellent speakers, the star of the show was clearly Thomas Jones, author of the recently released Mastering Genealogical Proof (http://www.ngsgenealogy.org/cs/mastering_genealogical_proof). The first session by Tom Jones was entitled “The Jones Jinx: Tracing Common Surnames.” As one with a Welsh ancestor named William Williams and a number of English ancestors named John Taylor, I was eager to hear Tom’s advice. Tom showed a slide of the most common surnames and, upon a quick glance, I realized that I have at least five of them: Jones, Taylor, Williams, Miller and Lewis. Tom presented a case study of an ancestor with the common name Jones. By utilizing a series of charts that compared and contrasted information from various sources, he was able to finally identify his ancestor. He emphasized that one must be systematic and thorough, that you should leave no stone unturned and that you should be skeptical in your research. He recommended studying all the people with the common surname in the county of interest so as to rule out unlikely candidates. I’ll have to try that with some of my common surnames. While discussing the topic of common surnames, Tom gave other handy tips such as the value of reading county censuses line by line, weekly newspapers are easier to search than dailies and the importance of being alert to altered records. Don’t assume your ancestor had no estate. Different states have different estate laws. It is often better if your ancestor had no will, because there may be more records. The probate process can take years, so be sure to check records over a long period of time. A careful examination of an inventory will give you a picture of your ancestor’s life. A nephew was not always a nephew as we understand the term. People can use a variety of names throughout their lives. Look for probate books and papers. There was much, much more. I love listening to Tom Jones speak. He gets right to the point, is humorous, uses good illustrations and loads his talks with helpful advice. I have purchased his book, Mastering Genealogical Proof, and I intend to read it carefully. 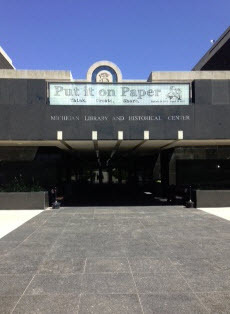 Thank you, Archives of Michigan, Tom Jones and all the other people who helped make this seminar a success!